In chemical gobbledygook, acetyl-l-carnitine is the short-chain ester of carnitine or simply the ‘acetylated’ form of carnitine. 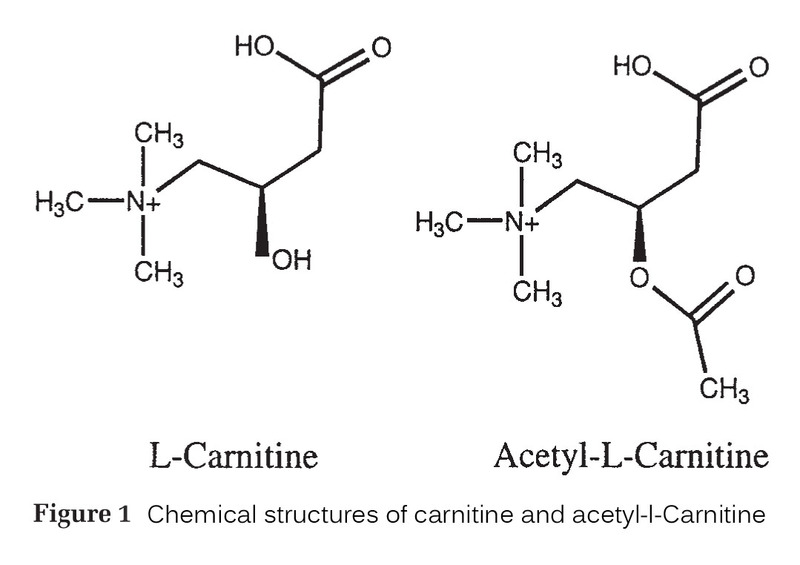 As seen below, the structure of carnitine and acetyl-l-carnitine only differ with regard to the acetyl moiety. The additional acetyl moiety on acetyl-l-carnitine can be transferred to a number of other compounds in the body and thus confers a number of additional functions to that of normal l-carnitine. As an example, acetyl-l-carnitine has been shown to affect fatty acid, carbohydrate and amino acid metabolism. In the brain the acetyl moiety allows for easy diffusion across the blood brain barrier where it can be used for synthesis of acetylcholine, fatty acids and amino acids. Where Does Acetyl-l-Carnitine Come From? Acetyl-l-carnitine is synthesised from carnitine within the body. However, it is not known to occur in food. Much attention has been directed towards the possible role of acetyl-l-carnitine as a therapeutic agent in aging and disorders of the brain9. Plasma and cerebral spinal fluid concentrations of acetyl-l-carnitine increase after oral administration, and the compound is transported across the blood brain barrier3, 10. Acetyl-l-carnitine supplementation has shown beneficial effects in the treatment of aging, chronic degenerative diseases and slowing the progression of mental deterioration in Alzheimer’s disease (AD)1, 2. Much of the research concerning acetyl-l-carnitine’s neuroprotective properties has been conducted in mice and rats. Nonetheless there have been a number of noteworthy studies, namely, following spinal cord injury6 and traumatic brain injury7. These studies suggest acetyl-l-carnitine has the potential to act as a neuroprotective agent is cases of brain trauma and injury. There are no reported negative side-effects of oral supplementation with acetyl-l-carnitine. Acetyl-l-carnitine is typically given at doses between 500mg and 2000mg. (Linus Pauling website).Very little is known regarding the metabolism of acetyl-L-carnitine relative to l-carnitine; however, its bioavailability is thought to be higher than l-carnitine. The results of in vitro experiments suggest that acetyl-l-carnitine is partially hydrolysed upon intestinal absorption4. In humans, administration of 2 grams of acetyl-l-carnitine per day for 50 days increased plasma acetyl-l-carnitine levels by 43%, suggesting that some acetyl-l-carnitine is absorbed without hydrolysis or that l-carnitine is reacetylated in the enterocyte5. Given its potential to enhance focus, memory and concentration, acetyl-l-carnitine is best taken first thing in the morning. Acetyl-l-carnitine has a very sour taste and is hydroscopic making it challenging to combine it with other ingredients in a powder form. As such, acetyl-l-carnitine is normally sold as a stand-alone ingredient in powder or capsule form. Given its association with l-carnitine and its indication for fat loss, acetyl-l-carnitine is commonly stacked with other fat metabolisers and fat burners. Acetyl-l-carnitine has been reported to increase agitation in some Alzheimer's disease patients and to increase seizure frequency and/or severity in some individuals with seizure disorders8. 1. Forloni G, et al. Neuroprotective activity of acetyl-L-carnitine: Studies in vitro. J Neurosci Res. 1994;37:92–96. 2. Spagnoli A, et al. Long-term acetyl-L-carnitine treatment in Alzheimer’s disease. Neurology. 1991;41:1726–1732. 3. Kido Y, et al. Functional relevance of carnitine transporter OCTN2 to brain distribution of L-carnitine and acetyl-L-carnitine across the blood-brain barrier. J Neurochem. 2001;79:959–969. 4. Gross CJ, et al. Uptake of L-carnitine, D-carnitine and acetyl-L-carnitine by isolated guinea-pig enterocytes. Biochim Biophys Acta. 1986;886(3):425-433. 5. Rebouche CJ. Kinetics, pharmacokinetics, and regulation of L-carnitine and acetyl-L-carnitine metabolism. Ann N Y Acad Sci. 2004;1033:30-41. 6. Patel SP, et al. Acetyl-L-carnitine ameliorates mitochondrial dysfunction following contusion spinal cord injury. J Neurochem. 2010;114(1):291-301. 7. Scafidi S, et al. Neuroprotection by acetyl-L-carnitine after traumatic injury to the immature rat brain. Dev Neurosci. 2010;32(5-6):480-487. 8. Hendler SS, Rorvik DR, eds. PDR for Nutritional Supplements. Montvale: Medical Economics Company, Inc.; 2001. 9. Jones LL, et al. Acylcarnitines: Role in brain. Progress in Lipid Research. 2010;49:61–75. 10. Parnetti L, et al. Pharmacokinetics of IV and oral acetyl-L-carnitine in a multiple dose regimen in patients with senile dementia of Alzheimer type. Eur J Clin Pharmacol. 1992;42:89–93.